Here at EyeQuant, we are often asked what the difference is between EyeQuant and click-tracking tools such as ClickTale or Crazy Egg. 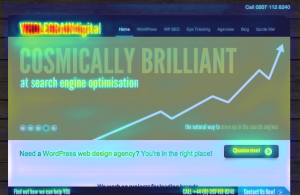 Many marketers assume they are the same thing – afterall, they're all heatmaps of your webpage, right? Just as the energy-efficiency heatmap conveys completely different information than the Twitter heatmap, EyeQuant conveys completely different information from a click-tracking heatmap because the underlying data is very different. What it is: products like CrazyEgg allow you to place code on your website and record data on where users clicked on your webpage. The insight is represented in heatmap form by assigning colours to different elements of the page based on how often they were clicked. What it tells you: where people click the most (and least) on your webpage. Why it's useful: Click-Tracking gives you insight into the conversion funnel. What path do your visitors take from the landing page to the page where they ultimately process an order? It also helps you identify usability issues. For example, are people clicking on elements that aren't actually links? What it is: EyeQuant uses a patented model of the human visual attention system to assign a kind of “attention score” to each element of your webpage screenshot. These values are then translated into colours, and areas with lots of “heat” are looked at first by visitors. The model was created by performing actual eye-tracking studies on hundreds of participants looking at landing pages for 3 seconds each. This data was used in combination with a sophisticated machine-learning process to create a model that could accurately reproduce the real eye-tracking results – almost instantly. The eye-tracking studies took place in the lab of EyeQuant Co-Founder Professor Peter Koenig at the University of Osnabrueck. What it tells you: when someone comes to your website, what do they see (and miss) right away? What grabs their attention – before users have done anything meaningful with their mouse? Why it's useful: EyeQuant allows you to ensure that users see the most important content right away: what is the offer, why is it interesting, and what should the visitor do next? If these 3 critical pieces of information are visible immediately you can expect lower bounce rates, higher engagement and ultimately a higher conversion rate. See our Groupon Case Study for an example. Which should I be using – Click tracking or EyeQuant? As we've seen, these two powerful tools are very different in terms of the insight they provide, so a serious online marketer should have both in his/her arsenal. EyeQuant should be used for instant analysis of a page before it even goes live. Based on the results, you can iteratively optimize the page and improve it without any traffic. When you're happy with the first impression that your page will make, you can go live and use click-tracking to get a better idea of how people are actually interacting with the page and how they move around on your website. Make sure to use EyeQuant again any time you update the content on the page. Any change on the page affects how people will look at it. Something as trivial as changing a picture can dramatically affect the attentional landscape of the page. 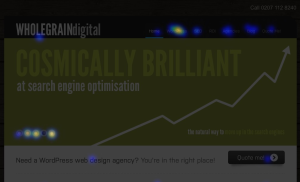 Whenever you analyze and interpret either an EyeQuant heatmap or a click heatmap, it's important to keep your own internal "wishmap" in mind: that's the heatmap that represents which areas of your website users SHOULD see AND click on – value propositions, keywords, call to action buttons etc. Whenever you find that your own "wishmap" deviates too much from both your attention map and your click map, you know you've found one of the best optimization levers around: people aren't clicking because they can't see the good stuff right away!